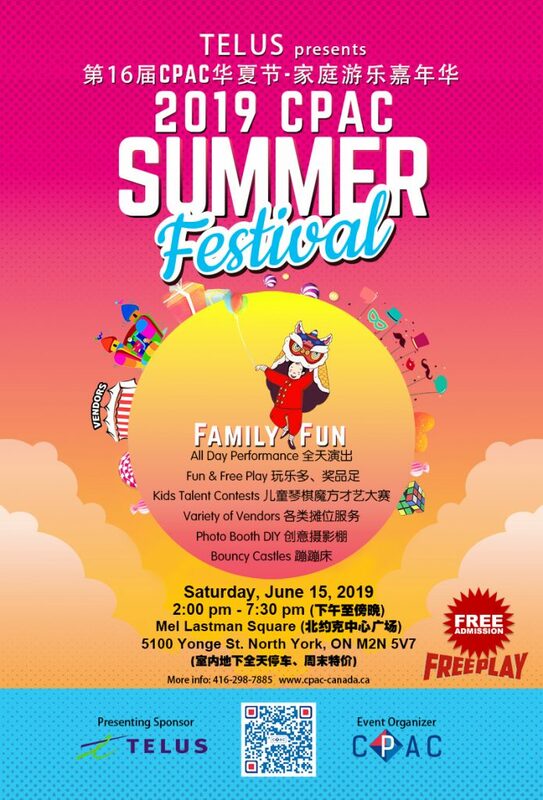 Come to show your talents and get ready for some fun in the sun with exciting activities and prizes at the 16th Annual CPAC Summer Festival on Saturday, June 15, 2019 at Mel Lastman Square, located at North York Center (5100 Yonge Street, Toronto). CPAC Summer Festival is an annual event where CPAC, along with many other community associations, gather to celebrate multiculturalism with thousands of participants. This is one of the largest outdoor family-oriented events in the Chinese community. The CPAC Summer Festival is held in a carnival format featuring a variety of programs, games, and entertainment for multi-generational families. Highlights include cultural performances, family activities, ethnic food vendors, gift bags, lucky draws, and much, much more. We were honoured to be an IGNITE community partner co-celebrating the TORONTO 2015 Pan Am/Para Pan Am Games, held successful event for Canada’s 150th birthday celebration in 2017, and celebrated Canada-China Year of Tourism in 2018. This year’s theme is Family High Fun. TELUS is the presenting sponsor of 2019 CPAC Summer Festival. Following last year’s success, the 15th Annual CPAC Summer Festival will be a step up with greater opportunities for businesses to reach out to the Chinese and multicultural communities. In previous years, we had as many as over 5,000 people attending the event in a single day. Enquiries: please contact Tinna at: tinna.xu@cpac-canada.ca, (416) 298-7885 x 112. Are you good at playing Diabolo, shuttlecock kicking, figure skipping rope or hula hoop? Come and show your talent. We invite you to be the instructor at CPAC Summer Festival to lead the kids play and distribute prizes to the participants. Come to show your talent on the CPAC Summer Festival stage. We are now recruiting all kinds of performers, e.g. singing, dancing, martial arts, etc. Performances involving the theme of multiculturalism are especially encouraged. Please contact Jennifer at Multi-Culture & Folk Arts Association of Canada (the event’s supporting organization) by phone at (416)733-4644, or emai at fandrum@hotmail.com for more information. Show your talents at Summer Festival and win certificates and prizes. There will be on-site contests for art performance, go, chess and Rubik’s Cube Competitions. All finalists will receive a certificate. Please register at tinna.xu@cpac-canada.ca , (416) 298-7885 x 112. CPAC is looking for flexible and detail-oriented volunteers to assist with this event. Volunteers will be provided with 2 TTC tokens and lunch. A volunteer certificate and documentation of hours will also be provided. Mandatory training takes place on Thursday, June 13, 2019 6:00pm at the CPAC office (4150 Finch Ave E. Toronto ON M1S 3T9) with a basic dinner provided. Volunteering roles include: Event setup & tear down, Registration/Gift packs distribution, Children’s Sports/Games Coordination, Stage Management/Coordination, Marketplace Coordination, Parking Coordination. Please email the 2019 Volunteer Registration Form to: office@cpac-canada.ca for registration. For any other volunteer-related questions, please contact Nancy at 416-298-7885 x 101. Free admission and play. Live Performance, Kids & Family Activities, and Kids Talent Contests.